Fact: The FBI Archive contains a flight path map of unknown origin. Fact: A placard, located inside the aft stairs, blew off after the airplane stairway was lowered. This placard was later found on the ground. Interpretation: The location where the placard was found places a constraint on where the plane was at that time. Further interpretation: If the placard was within the natural 8-mile width of the Victor airway shown on the FBI map, it suggests the airplane was on that path and gives the map credibility. 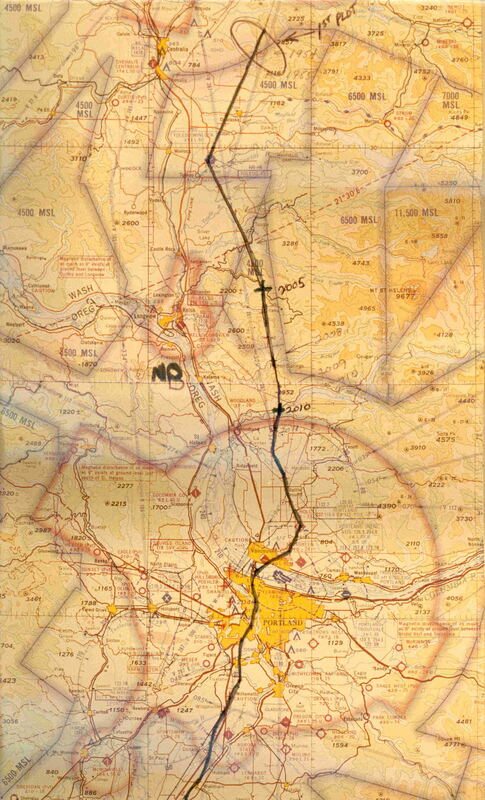 Figure 1 shows the FBI's map of the flight path that flight #305 took the night of the hijacking. Its validity is at the center of arguments for several different theoretical flight paths surrounding the money find on Tena Bar. These different flight paths (Fig. 2) eventually require the hijacked airplane to be in a certain place, at a certain time. Each theory requires a different place, so if any physical evidence or transcripts point to one flight path location or another, it will give credibility to that theory. The simplest theory is that Cooper jumped when the plane passed over Tena Bar which is nine miles west of the FBI flight path (Fig. 2 in green). The second possibility is the Washougal Washdown Theory (Fig 2. in blue) that requires the airplane to be approximately 10 or more miles east of the Victor Airway shown on the FBI map (Fig 2. in white). The last theory is that the FBI map is accurate, thereby ruling out the other two theories. The night of the hijacking, both air traffic control and military radars were following the plane . The FBI transcripts talk about working with this 'data' to reconstruct the airplanes path  and using the SR-71 spy plane to overfly and photograph the flight path . It has been proposed (but not verified) that the FBI map represents the flight path based on the radar data. The flight transcripts give several specific locations and times for Flight #305 using 'DME' (Distance Measuring Equipment) radio beacons . The transcripts also were clear on the planes altitude at 10,000 ft. and airspeed hovering around 165 knots. Cooper in fact dictated an altitude of 10,000 ft and flaps at 15 degrees which the pilots complied with. The DME positions were north and south of the jump point allowing a speed and distance calculation across the important jump zone. A simple calculation was done to determine if the time required to cover the distance between the two DME points matched the known airspeed of the plane . A second more refined independent calculation (4) was also included as a double check on the initial calculations. The exact location of the recovered placard was never publicly available so the original family that found the item was contacted. They provided GPS coordinates of the find location. The area was a traditional family hunting ground used for decades so the information is deemed reliable. 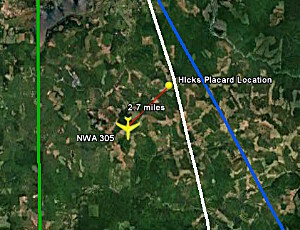 The FBI flight path map was superimposed and aligned on Google Earth and a white line was drawn down the center-line of the marked path (Figs. 1, 2). The results of the two DME calculations [3,7] were similar in that both airspeed totals were close to the reported indicated airspeed of 165 knots indicated air speed (190 mph). As a cross check on the flight path, this points away from the Washougal theory because there is not enough time or speed involved to fly ten miles further east and still return on time to the southern most DME position via Portland's airspace. The FBI transcripts identify the towns of Toledo, Pigeon Springs, Ariel, Highland, Battle Ground and Vancouver as being either on or near the radar recorded flight path . This information coincides with the FBI map and does not support an overflight of Tena Bar or the Washougal River. The placard was recovered at the location shown in Figure 2 which is near Toutle, and 20 miles north of the Ariel Washington jump zone. This location is almost directly under the FBI flight path. Giving the placard a free fall time of nine minutes and a south west cross wind of 18 knots, then the plane would have to been 2.68 miles from where the placard was recovered and 2.6 miles west of V23 . This distance is well within the official 8 mile width for the Victor airway and is 4 miles east of the theoretical Tena Bar flight path. 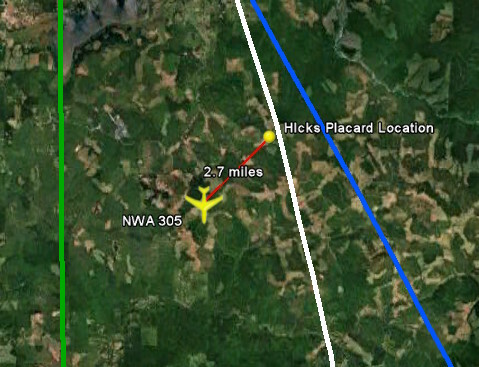 This data places a constraint on the planes position approximately six minutes before the jump and suggests flight #305 was on the original FBI flight path. Anecdotally, the original air traffic controller that handled the Northwest Airlines flight north of Portland was interviewed directly over the phone. He volunteered that he was sure that Flight #305 never left the V23 airway the entire time he had them on radar. Understanding the flight path is a critical first step in determining the history of the money and how it became buried on Tena Bar. The various lines of evidence all point to the original FBI flight path as accurate and do not support the Tena Bar overflight or Washougal Washdown Theory. This research finds no reason to believe that the FBI fight path or the jump zone was in error. This does however create a large obstacle in explaining how the money came to rest on Tena Bar. 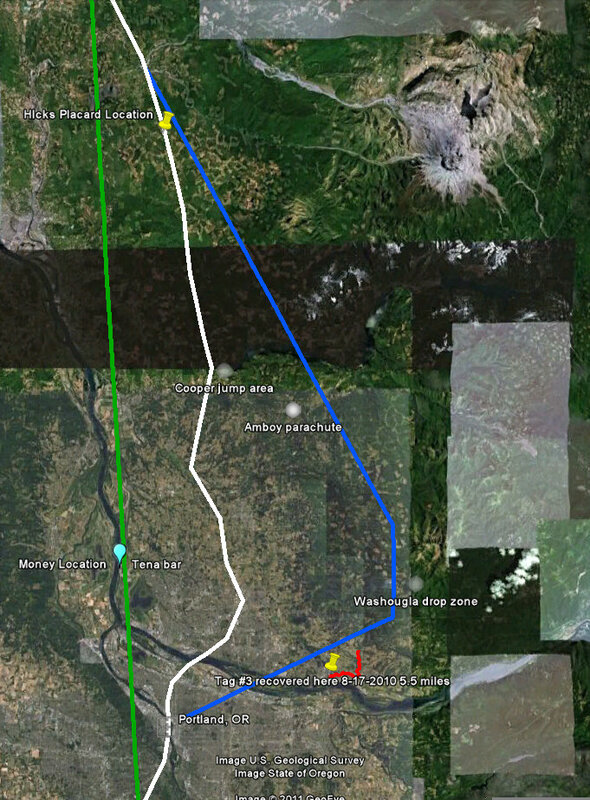 The flight path information along with other research presented here, provides no support for naturally transporting the bundles to Tena Bar via the Columbia River. This leaves only a mechanical or human explanation. The human explanation has historically been ruled out due to the belief that Cooper died in the jump. After 40 years, no body or other evidence has ever been found, suggesting that the idea Cooper died in the jump may be in error. A mechanical explanation has additional obstacles, so the processes that transported the money out of the woods and then twenty miles to the sand bar remains a mystery. 1. FBI Transcript: "The aircraft was tracked by the U.S. Air Force at McChord Air Force Base, as it proceeded south on Vector (sic) 23, and precise tracing of that route has been provided by the Air Force and became a basis for a search in the Southwestern part of the State of Washington." 2. FBI transcript: "Will maintain contact with Beale Air Force Base concerning the flight of the Air Force SR-71 and advise the results of the flight and when the pictures might be available." 3. FBI transcript: "7:40 PM PST 14 DME S SEA VOR at 7000'. Gear down, flaps extended to 300"
"0422 M S PDX (DME 10,000) 165 IAS" This time given in Universal Time, entry was a hand written note. 4. Personal communication, Robert Nicholson: Mr. Nicholson did an independent calculation of the DME positions, time enroute and airspeed. His conclusions were that there was very little winds alloft and the ground speed of the plane was close to the airspeed. His analysis can be downloaded here. 5. FBI Transcript: "The flight continued on Vector (sic) 23 and passed over or near the following cities, or towns in the States indicated: Washington Onalaska, Ethel, Toledo, Pidgeon Springs, Ariel, Highland, Battle Ground, Vancouver"
6. Personal communication, Robert Nicholson: Mr. Nicholson did a free-fall analysis of the placard that can be downloaded here. 7. Quick calculation of DME positions vs speed. Distance traveled = 130.75 miles in 42 minutes.